This two flier semi-auto armature coil winding machine is especially designed for winding even slot armatures. It`s suitable for hook or riser type Commutator armature. This Armature Winding Machine is widely used in many armatures field like automobile motor, motorcycle motor, house appliances series excited motor, power tool motor and various kinds of PM DC micro motor. It`s an economic, fast and reliable specialized winding machine. 1. This winding machine adapts double flyers structure, 1set 1KW servo motor drive the two flyers rotation, and 400W indexing servo motor. During working, the armature is clamped tightly by two nos winding tooling and clamping device. When flyers are running, wire goes through the wire holder, tension device then enters hollow spindle, comes out from wire sliding wheel, then the wire slides into the armature slot through flyer wire guiding wheel. After this step, put armature into the slot to do winding. 2. This machine adapts servo system to do winding. Meanwhile, machine action is controlled by true color human-machine PLC controller; armature indexing is controlled by big power stepping motor; servo speed is controlled by double flyers rotation speed. Moreover, this machine has other functions, such as slow increasing speed when starting, Max. speed limit, brake time, CW &CCW rotation, counting pre-set, etc. With complete function and reliable running, this machine is convenient for operation. 3. The machine fixture is controlled by pneumatic cylinder, high performance with low cost. It`s equipped with working plate, to operating more convenient. a. Altitude should not be above 1000m. b. Ambient temperature should be within -10℃to 40℃. 2. The machine body should be installed steady. 3. The power source should match the machine requirement. Looking for ideal Semi-auto Armature Winding Machine Manufacturer & supplier ? We have a wide selection at great prices to help you get creative. 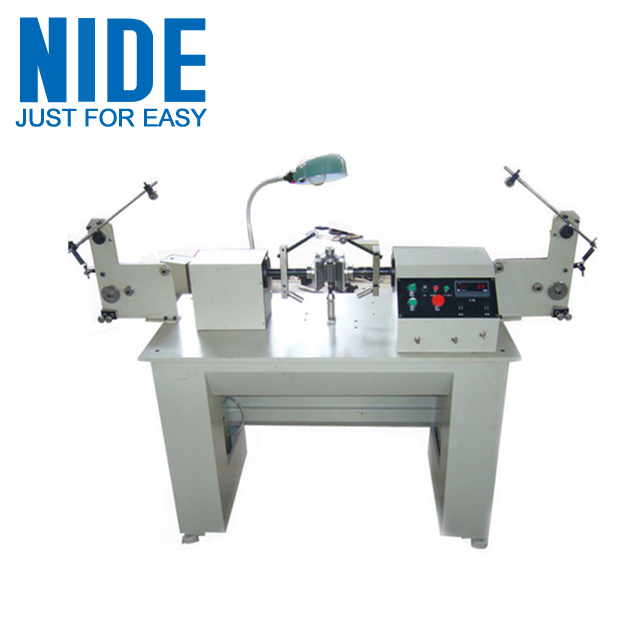 All the Two Flier Armature Winding Machine are quality guaranteed. We are China Origin Factory of Semi-auto Armature Coil Winding Machine. If you have any question, please feel free to contact us.